Perspective. Gain some perspective on your engineering thinking, culture, the world, and more. Getting out of your usual surroundings and experiencing the world a bit differently is extremely valuable. You might call this a peek into global citizenship. Diversity is amazingly invigorating. Engineering. 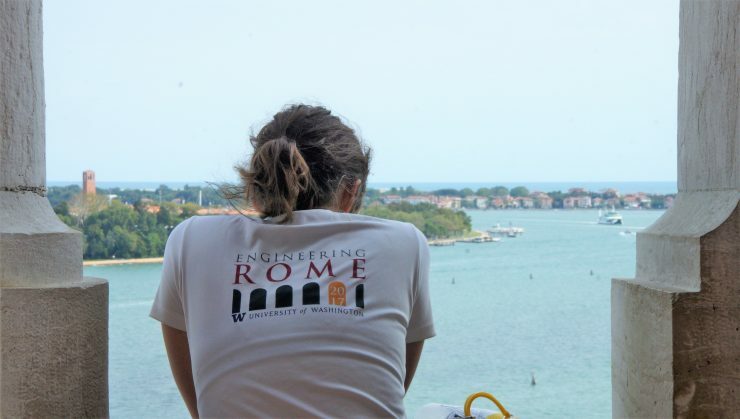 Yes, we do actually study engineering while in Rome. While you cannot get a degree in engineering based on this class, it does offer a different perspective on engineering and what it is used for and how it is done. From the ancient to the modern, Rome has it all. For some of this stuff, we do it in a classroom then get to go see it in action. People: Romans, classmates, or otherwise. Get to know a small cohort of engineering-minded students. Not everyone is an engineer but we all share an interest in these sort of things. Get to know your classmates over 3+ weeks in Rome. If you are early in your UW career, you may meet someone you enter a department with later on. It’s great to know folks early on like that. Hey, you may even meet someone you will know 50 years later. We haven’t been around that long yet, but we suspect it could happen. You can also meet some locals, the folks at the Rome Center, others taking study abroad classes, etc. See the world (that includes Rome). What a great idea to experience this planet we all live on in an up-close and personal way. It’s not the same as being a tourist in Rome. You live here, with your peers for 3+ weeks. I guarantee you will feel a bit local by the time you leave. Why not you? Can you picture yourself in Rome? You might be able to think of a whole lot of reasons why you just can’t go to Rome this year. But you only need one reason to apply (you pick the reason). By the way, that’s Venice in the picture at the top of the page. We go there too.